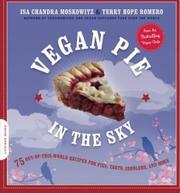 The icons of hip vegan cuisine tackle the heavyweight champ of American dessert: pie. Moskowitz and Romero (Vegan Cookies Invade Your Cookie Jar, 2009, etc.) are the force behind the fantastic vegan website The Post Punk Kitchen (theppk.com); among their long list of credits, the authors have reinvented both the cupcake and cookie formats for vegan bakers. Here, bursting with an “anyone-can-do-this” approach and a defiant “non-vegans-won’t-be-able-to-tell-the-difference” attitude, they provide dozens of recipes for classic fruit pies, cobblers, crisps and cheesecakes. Vegan cooks can look forward to whipping up a pear and cranberry galette that will even have their carnivorous relatives scarfing down a second slice at the next family gathering. Before getting started, the authors concisely cover all the basics, from ingredients to equipment, in the aptly titled chapter “How to Create the Universe or Bake a Pie from Scratch.” All the ingredients used are now easily available at most health-food stores or your local Whole Foods. And don’t miss the recipes for vegan toppings like “Rad Whip,” a vegan version of Cool Whip that will please even the staunchest dairy advocates. More than just a niche guide, this mouthwatering collection of desserts will satisfy even the most reluctant reader.